Cheryl Moore has more than 34 years of experience stormwater training and education, data collection, analysis of erosion problems and preparation of stormwater pollution prevention plans. Ms. Moore is a certified advanced inspector and trainer for FDEP’s Stormwater, Erosion and Sedimentation Control Inspector Training and Certification program, and is a licensed continuing education provider for the Florida Board of Professional Engineers, the Department of Professional Regulation (Construction Industry) and the Florida Board of Landscape Architecture. She has taught more classes and has certified more people than any other trainer in the state, and has conducted numerous assessments for erosion/sediment control, Good Housekeeping Practices, Illicit Discharge Detection and Elimination, and High Risk Facilities. 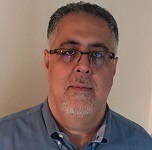 Bassam Moubayed, CFM, EI, has over 26 years of experience in the stormwater field ranging from NPDES compliance, drainage design, Stormwater Management Master Planning, the Community Rating System Program (CRS) and Construction Management. Mr. Moubayed holds Bachelor of Science degrees in Civil Engineering and Architectural Engineering from the University of Miami. He has been a Certified Flood Plain Manager since 2006. He is an Engineer Intern (EI) and an FDEP Stormwater Erosion and Sedimentation Control Instructor.